On a cold November Sunday night in Philadelphia not too many people were out and about. But at the World Café Live, near the Ivy League campus of the University of Pennsylvania, there was beautiful music happening with or without the crowds. Even the upstairs of venue has a special feel when it's not overly packed. It felt like a jazz night. Most couples were sitting at their tables with their bottles of wine and beer anticipating the talented Marco Benevento's current project. The first half of this tour was played with bassist Reed Mathis (Jacob Fred Jazz Odyssey) and drummer Jon Fishman (Phish). The second half of the tour, which included this show, consisted of bassist Marc Friedman (The Slip) and drummer Josh Raymer (Jacob Fred Jazz Odyssey). With this amount of talent on stage, it was surprising how small the crowd was. It is like seeing the SuperJam at Bonnaroo without the masses. I was excited, and the show did not disappoint. I was also excited about seeing the songs live from the new album Invisible Baby. 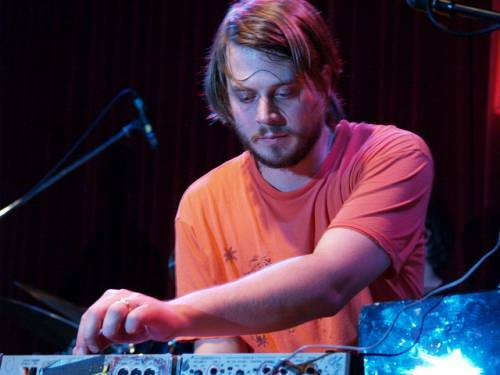 This acclaimed album features Marco Benevento's piano melodies combined with his talented use of toy pianos, mellotrons, glockenspiels, and many other technical tricks. The crowd gave the band a boisterous Philadelphia welcome as Marco introduced the band. One member of this show that the fans did not expect to see was Jay Cooper. Cooper was there to display his art work on a large screen behind Marc Friedman. He used images of the band and other patterns to add color to the stage. As Benevento started his first song with a piano solo introduction, the crowd quieted and listened intently. After the first two mellow, but beautiful songs, they covered My Morning Jacket's "Golden," which was amazing! Then after a Leonard Cohen cover they jammed into a song that they wrote the night before that was full of funk. Marco set a repeated effect to trance the crowd into the first song of off Invisible Baby called "Bus Ride." The crowd came alive for this one, and the small feel of a jazz show turned into funky, trance, rock, and jazz show. The band played two more off of the new album, and then covered the Zombies song "She's Not There." This was the last night of the tour so they were not pulling any punches. They thanked everyone and then decided to have a comedic question-answer session with the crowd. Marco said, "Ask Marc Friedman anything you want." Some wise sage from the crowd asked him, "Would you rather fly or talk to animals?" After some time thinking, he replied with a silly answer to get himself out of the question. Then someone yelled out, "Who's your favorite bass player?" He thought for a moment and replied, "Karl Denson," while shrugging his shoulders. It was fun, laid back, and intimate in the room, so the band had fun with the crowd. Then, Marco said, "Time to get down," and closed the show with "Friends" by Led Zeppelin. This was a really great intimate journey looking into the head of Marco Benevento as a front man. He does a great job of it. He's personable, musical, and happy. It's the kind of show that leaves one with a really good feeling inside. I'm sure he'll be touring soon with his old buddy Joe Russo as the Duo, and I'm really looking forward to hearing what comes out of them next.